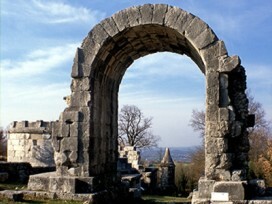 The Archaeological Area of Carsulae, ancient remains of a Roman town, and the Centro Visita e Documentazione (Visitor Center and Documentation) "U. Ciotti" organize a series of meetings in between literature, games, workshops, history, education and good food, with 2011-2012 CarsulaEventi. After the first appointment of Sunday, December 11th, 2011 "Carsulae, edizione straordinaria - lancio di notizie per bambini che capiscono al volo" ("Carsulae, special edition - news launch for children who savvy"), in 2012 there will be another 13 meetings, the last on May 13th, 2012. The first of these 13 will be Wednesday, January 4th, 2012 from 16:00 at the "U. Ciotti" Visitor Center and Documentation with "Da un cantu fiocu nasce immensu un coru": Homage to Alighiero Maurizi with Christmas music and poems by the "Terra Majura" Cai of Terni Choir. Free event. Saturday, January 7th, 15:30, "Possa il miele colarti addosso" ("May the honey run upon you"): rendez vous of good wishes to the way of the Romans, with delicious nectar. Free event. And then, for example, Sunday, February 12th, 2012 "Bugiardino romano": game for couples and singles aspiring to recognize true love and be wary of imitations. Kiss Mousse and amaretti in the mouth. At 15:30. Sunday, March 4th, 2012 15:30 hours "Donne che la sapevano lunga e l'hanno fatta corta" ("Women that knows it long and made it short"): Stories and words of women with sweet slices. Sunday, April 15th at 9:30 "Passo di Bastoni: Nordic Walking a Carsulae": the Nordic Walking with poles is welfare and culture in moving. Eco-cultural path and test-lesson by Sergio Peruzzo, Nordic Walking Instructor of the Italian School, Section of Terni. Closing on Sunday, May 13th, 2012 from 16:00 "Carsulae, edizione straordinaria - lancio di notizie per bambini che capiscono al volo" ("Carsulae, special edition - news launch for children who savvy"). Special guest: La gatta tra i libri di Roberta Argenti e Carmen Poidomani (The cat among the books of Roberta Argenti & Carmen Poidomani). Recreational activity and snack.